The idea of an inspection is often enough to set any business owner on edge. However, understanding the purpose of a Fire Marshall inspection helps to ease your mind. A Fire Marshall inspection is intended to assist in keeping you, your business, and your employees safe and legal. The Fire Marshall is there to help identify and correct potential fire and safety hazards in your building. Generally, there are four basic safety checks the Marshall will perform; suppression, electrical checks, flammables, and fire exits. Suppression - If a fire should happen, do you have sufficient systems in place to stop or slow the fire long enough to fully evacuate the building? The Marshall will look for evenly distributed fire extinguishers and fully operational sprinkler systems. Electrical Hazards - The Fire Marshall will look for exposed or not insulated wires as well as hazards such as multiple extension cords. In addition, he will check that the fuse box is properly labeled. The fuses should be clearly identified so that anyone in the in the building can correctly cut power to a location in the event of a fire. Flammables - Flammables including chemical waste must be properly stored and disposed of. Be sure all flammables including objects under pressure are neat and orderly. Fire Exits - All exits should be properly marked. In the even of an emergency, there should be a clear, easily found exit path. 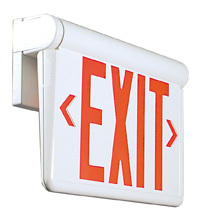 This includes having properly lit EXIT signs above the doors of your building. This includes lights that go on in the event of a power failure. Your Fire Marshall inspection, is a chance to ensure that you are providing the safest environment possible for your employees. Being prepared is key to surviving an emergency. To ensure your lighting is up to code or upgrade your emergency exit lighting, contact us today.